How and when did you first start running? I was never sporty at school; I used to hate PE and always did the Sprint at Sports Day as it was the shortest distance and meant I could get it over with. Fast forward a number of years to 2014 and on a whim I decided to sign up to a 10K with my sister and brother-in-law. 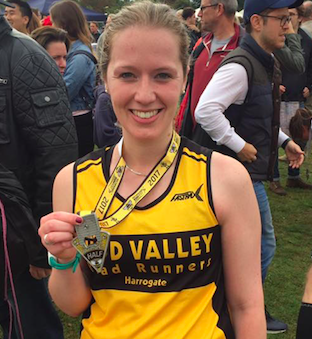 I had never run that distance before; I still remember the all-over pain I felt reaching the finish line but I felt like Mo Farah when I finished….and was hooked! I started doing Parkruns thereafter. What brought you to Nidd Valley? I got chatting to someone at Parkrun who mentioned Nidd Valley and that it was the “friendliest running club in Harrogate”. Which is absolutely true. Such a great bunch of people and there’s always someone new you haven’t spoken to before. It’s great running with a club where you all have something in common, even if you all have different reasons and goals for running. What is your favourite running music? Genre or specific tracks? I don’t listen to music all the time, but when I do it’s usually something upbeat like Calvin Harris or the like. What is your favourite food before and after running? Before a race – porridge. After – a big 3 course meal out somewhere to cancel out all those calories I’ve burned! What is your best running tip that you would like to share with us? Whenever you can’t be bothered to do that run, feel a bit lazy and skip that session, remember there is nothing worse than actually not being able to run or do what you love – due to injury, or illness. Work with what you’ve got while you have it, and remember, no matter how slow you go, you’re still overtaking whoever is on the sofa! What is your proudest moment in your running career? Probably finishing my first half marathon last year. What are your running goals? Get back down to my PB at Parkrun and one day run the London Marathon. What event are you training for at the moment? Brid half.